For users requiring a multi-purpose microscope for expanding health services, LW Scientific introduces the new i4 Epi Lumin™ Fluorescence microscope. With integrated LED technology for both bright-field and epi-fluorescence microscopy, the Lumin™ i4 offers superior clarity and crisp imaging—all at a price that allows even labs on a limited budget to benefit from the latest technological advances. The Lumin™ epi-fluorescence module converts our standard i4 microscope to a fully functional epifluorescence microscope. The resulting images rival those obtained from traditional, expensive epifluorescence systems. Illumination Brightfield: Moveable Abbe condenser, NA 1.25 Iris Diaphragm, Transmitted LED long-life light source 90-240V / 50-60Hz automatic switching. 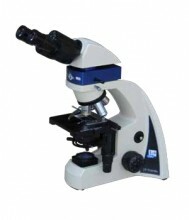 Click the button below to add the LW Scientific i4 Epi Fluorescence LED Microscope to your wish list.